I’ve always dreamed of having a beach house with a room full of built-in bunk beds so the kids could have all their friends sleepover. Whilst this dream may never become a reality, I wanted to share some amazing built-in bunkbed designs I’ve found, with fun and clever details. This is what I’m dreaming right? This image comes via My Scandinavian Retreat. The wide steps of the ladder double as shelves and the centre platform acts like a bedside table. Don’t you just love those whitewashed plank walls? Rope ladders are a great addition to bunk beds. The bunk beds on the left were designed by McAlpine Tankersley Architects as part of a beautiful beach house, and the ones on the right are from Susan Greenleef’s San Francisco house featured in Lonny Magazine. Even when space is tight you can build bunks into the room. This small room on the left from Style at Home via Decor Pad has built in bunk beds on either side with a small shelf under the window to act as a bedside table. Using VJ panelling gives the room a coastal feel and hooks provide extra storage. The room on the right was designed by Justine Hugh-Jones. She has cleverly wrapped the bunk beds around the corner of the room to utilise the space, and added decorative verandah brackets to add detail. The bunk beds on the left are from Stye at Home via Decor Pad. Individual lighting is great to include when you are designing built-in bunks so the kids can read in bed. 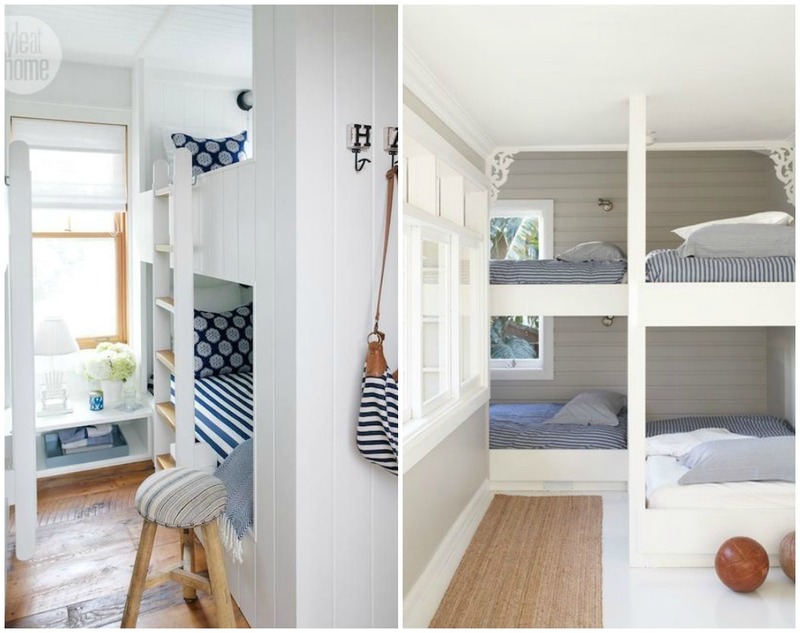 The bunks on the right are part of a Palm Beach cottage featured on Homelife. Make the most of the space under the links by including pull out drawers or baskets for storing toys or bedding. These built in bunk beds from Stonebreaker Builders are great – built in shelves at the head of the bunks, built-in drawers underneath, easy to climb ladder steps and nautical rope balustrade. My only concern would be having a ceiling fan so close to the beds, before you know it Buzz Lightyear would be attached to the fan flying to infinity and beyond.